If you don’t have access to a proper swimming pool this summer then check out these awesome temporary custom pool designs that you could make your self. Great idea but only has room for one. Just hope they remembered to empty the rubbish out of it first. 3. Isn’t The Water Supposed To Be On The Outside Of The Boat? At least this pool has a proper lifeguard. Is that a parachute holding the water? What better way to cool off than in a cool box full of water. You can park this pool anywhere you want. Great way to cool off in the summer, just hope the parking break is on. You could hook this up to the pick up above and have a double pool. Guess they are gonna have to take it in turns to use this pool. If you don’t have a pick up, trailer or wheelbarrow then you can use your front living room. Looks very inviting, who fancies a swim? 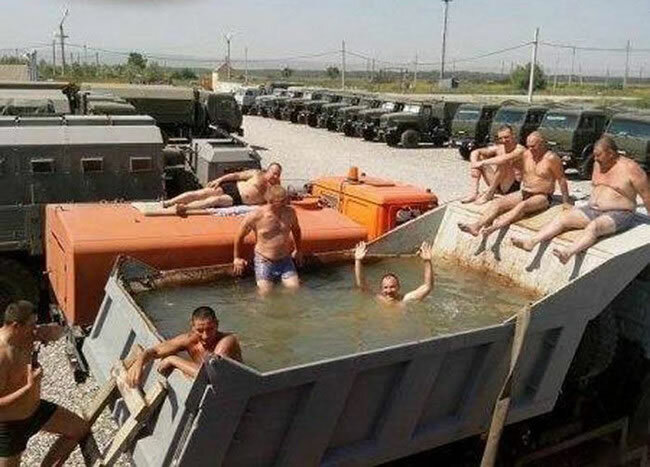 Just goes to show you can make a temporary pool out of anything. Taking a dip in this pool looks tiring. How about your own private pool bag. You could even make a special double one for you and your partner. Just don’t hit the dump lever. Recycle your old beer crates and bottles into a cool pool this summer. Find out more about this BMW pool car here. Looks more like a pot of human stew. Which of these temporary custom pool designs would you love to chill out in? – Most Crowded Swimming Pool In The World – Can You See The Water?